According to Politico, Limbaugh dismissed this fairly consequential news on Monday’s edition of The Rush Limbaugh Show, claiming that “he doesn’t believe it.” Rush Limbaugh taking an oppositional and unfounded stance? Mercy, what a world! Huh. Ok then, Mr. Big Time Guy. I guess you know better. 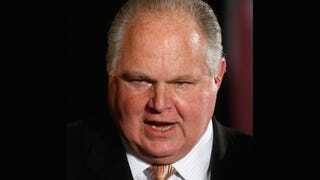 Limbaugh isn’t sure what sorts of liberal shenanigans are afoot, but don’t think for one second that his claims are lost somewhere in the grass of left field. “I would assume [the agenda] would be something to do with global warming,” our Moral Crusader eloquently surmises. A cross to bear, if ever there was one. But don’t stop believing, Rush — fight that speculative and groundless fight of yours. Yip yip yip yahoo.